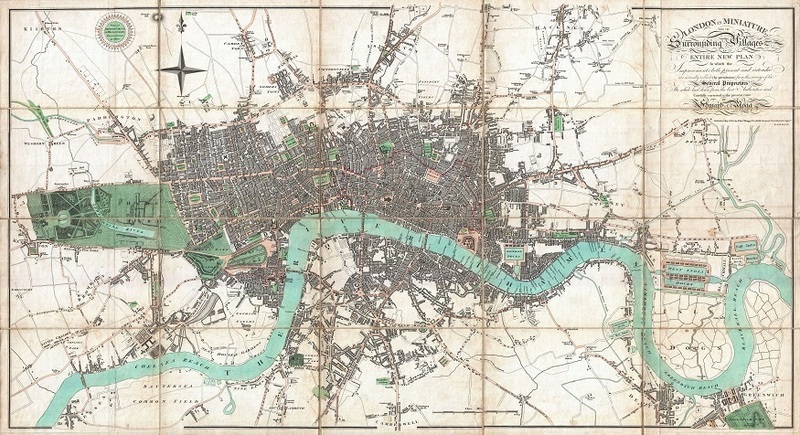 This beautiful chart is Edward Mogg's Pocket Map of London from 1806. When the map was drawn up, London was one of the largest cities in the world. To modern eyes, though, this version of the metropolis needs to exhale. Areas such as the East End, Bermondsey, Rotherhithe and Pimlico have yet to be developed, and the city's northern advance effectively ends at Euston Road (then called the New Road). You can browse a high-res image here. The circular feature is labelled as 'Proposed BRITISH CIRCUS 1 1/4 Mile in circumfer. Pleasure ground 42 Acres.' It looks like a huge housing development, between what is now St John's Wood and Swiss Cottage. What was this enigmatic Circus, and why was it never built? Plans for the land, owned by the Eyre family, had first been mooted in 1794. London was expanding rapidly at the time, and a tidy profit could be made on new housing. Unfortunately, the Napoleonic wars put development on hold for a decade. During a brief spell of peace, the Eyre family once again sought to build on their land. New plans were drawn up in 1803-4 by architect John Shaw and exhibited at the Royal Academy. This scheme included the so-called British Circus, a circular housing estate that would have boasted a similar grandeur to the famous Royal Crescent of Bath, but on an even greater scale. British Circus would have filled the land surrounding the modern St John's Wood tube station, as this rough superimposition shows. Shaw's scheme would have also been the world's first garden suburb, with 36 detached and 66 semi-detached houses standing in large gardens and a central 'pleasure ground' for the use of residents. It was all very different from the standard rows of terraced housing that are redolent of the Georgian and early Victorian eras. Alas, the wars flared up again a year later and the plans were again suspended. When work finally began on the St John's Wood estate in 1809, it was along less radical lines. The only nod to the scheme is the existence of Circus Road, which can be found between St John's Wood tube station and Lord's Cricket Ground. John Shaw never did get to build his Circus. If he had, the album cover of Abbey Road might have looked very different. But he did make his mark on London in other ways. With his son of the same name, Shaw laid out parts of nearby Chalk Farm (later home to that most famous circus, the Roundhouse), and was the chief architect behind St Dunstan-in-the-West on Fleet Street. With thanks to Peter Berthoud for assistance on this article.